Since the time of Agatha Christie, the village setting has been a staple of a certain type of mystery novel. A novel that is as much about the personal and family life of the protagonists as their jobs, that is more about human relationships and love and loss than international terrorism or guns-for-hire, thrives in the small town environment. There are plenty of advantages to setting a crime novel in a small town. People really do know each other in a small town, and they know each other’s business. Not good if you’re wanting to keep a secret. And secrets, criminal as well as personal, are the life blood of the mystery novel. I write the Constable Molly Smith series from Poisoned Pen Press (among other books). The Molly Smith books are police procedural novels, meaning that police officers are the protagonists of the books and they solve crimes in the context of doing their jobs. In these books I want to explore the personalities and families and relationships of the two protagonists as well as the nature of their job and the solving (or failing to solve) of crimes that are committed there. The small town setting allows the characters’ families and friends – and enemies – to be involved in the drama without having to employ unbelievable coincidence. 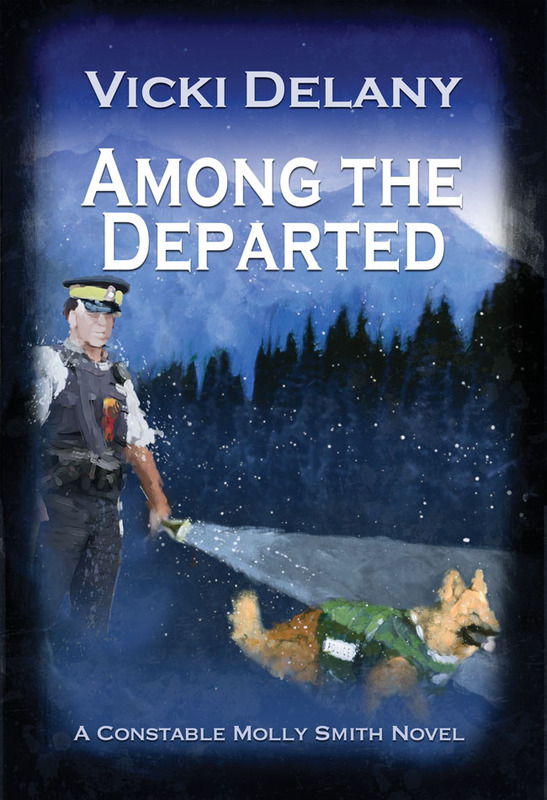 The plot of AMONG THE DEPARTED, the fourth book in the series, revolves around what happens when human remains are found in the British Columbia wilderness by a police dog out searching for a lost child. 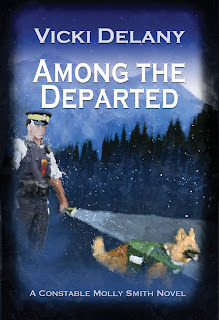 Because it is a small town, and a close-knit community, it is not too much of a stretch that the police dog handler should be Constable Molly Smith’s boyfriend, and thus she is with him when he gets the call, or that the bones are discovered to be those of one Brian Nowak who disappeared without a trace fifteen years earlier. The last person to see Nowak, other than his family, was a young girl by the name of Moonlight Smith., best friend of Nowak’s daughter who had spent the previous night at a sleep-over and joined the family for breakfast the next morning. In my novels, the small town setting has the added advantage of allowing me to give the main protagonist of the series, Molly Smith, a young, keen, somewhat naive new police officer, a role in criminal investigation. In a big city she would be directing traffic and issuing speeding tickets, but a small town force does with what it has. The 20-member Trafalgar City Police department allows her to become more involved in major crimes, plus the fact that she’s a local and Detective Sergeant John Winters is a newcomer, means he sometimes has to rely on her for local knowledge. It isn’t always easy for Constable Smith, trying to be a police officer in a town where, as she thinks in the first book in the series, IN THE SHADOW OF THE GLACIER: It was hard, sometimes, to be a cop in a town where a substantial number of the residents had seen you performing as Number Two Wise Man in the Grade Three Christmas pageant. The problems Smith runs into while policing in a town where everyone knows her so well, and where her mother is a prominent rabble-rouser and political troublemaker, is part of her appeal, I believe. The town of Trafalgar is based, not at all loosely, on the real town of Nelson, British Columbia, population 9,000. But Trafalgar is not Nelson, and sometimes, of course, real-life has to take a back seat to the interests of a good story. No one in Nelson can quite remember when the last murder was. In Trafalgar, there are rather a lot. As Sherlock Holmes pointed out, countryside does not always mean peaceful. Do you believe such treachery can exist in a small town? Authors, do you fear that too many bad things are happening in your series town? 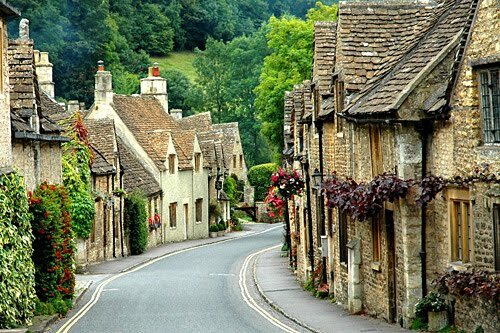 Readers, do you wonder how so many murders can happen in just one little village? Or do you shrug and say--it's only a story! I think there's a certain suspension of belief in a cozy series. An ordinary layperson isn't going to run into so many murders nor be able to solve them in real life. In contrast, we expect our amateur sleuths to encounter dead bodies all the time, making him/her sort of a jinx to be around. But that's the premise of the traditional mystery, and we accept it as a fantasy, not reality. I love small town mysteries--your series sounds great Vicki! Don't you think that's why readers love traditional mysteries though? We get to know the characters and the setting and enjoy revisiting with each book. For me anyway, that's the real draw of this kind of story. Ms. Vicki is an insightful and clever writer. She can make anything seem believable. Love your idea Jersey Jack. I must confess that in the real town on which Trafalgar is based no one can quite remember when the last murder happened. Thanks for letting me join you today, Hank. I think village mysteries will always be popular, for most of the reasons you've mentioned, Vicki. The readers willingly agree to suspend their disbelief, as we often have to do with many other types of mysteries. I love the Const. Molly Smith series. She's a strong character with self-doubts, an eager learner and someone who truly believes in the job she's doing. And, I'd love to spend a week in Trafalgar. YOur name has been on my "find this person's books" list for some time. I look forward to diving into your series as I love BC and small town mysteries. I'm sure you've created some lovely tension by partnering Molly, a rookie with local roots, and John, an old-hand from away. As anyone who lives in a small town knows, there are some things natives will know intuitively that outsiders can never completely understand. Congratulations to you on release of your newest novel this week. Hi, Vicki. I like what you said: "The small town setting allows the characters’ families and friends – and enemies – to be involved in the drama without having to employ unbelievable coincidence." YES, your character can plausibly "run into" friends etc. and the reader will go along with you. I don't think I've seen many mystery series set in British Columbia. But it seems tailor made for the genre. Yeah, Jack, you've got to admit you might have thought something was gong on behind those walls! Our across-the-street neighbors put up a big fence actually, and my next-door pal and I were all about finding on what was going on. And you know, if look out our third floor window, I can see right into a neighbor's house. If they leave the curtains open. But of course I wouldn't look. Hallie, one of my daughters lives in Nelson and it is my favourite place on earth. And Erica, I am going there for two whole weeks in May. Can't wait. Hi Vicki. It was good seeing you at Malice. We just had a double murder at our very nice condo complex in Arizona. Son high on drugs killed stepfather and tried to kill mother. It can happen anywhere, but it's certainly shaking when real crimes take place under our noses. Usually they are safely on the page. DO we even know our neighbors, usually? Would you know if something strage were going on in your neighborhood? Vicki, do you write from experience? After police descend on some hideous crime scene, people are always saying--oh, he seemed like such a quiet sort..
Maybe that's why we all like the small town setting, Hank, because we WISH our neighborhoods were like that. Hank asks if I write from experience. Definately not! I live in the countryside and the nearest town is even smaller than Nelson... un Traflagar. I went on a ride-along with the police in my area one night and he didn't get one single call. We drove around in the dark all night. I think part of the appeal of the "village mystery" is the contrast between apparent safety and innocence and the hidden violence. It's certainly shocking in real life. We had a case of multiple murders in my idyllic historic neighborhood a few years ago that was so horrible it made the news in the UK. I was in London and read about it in the Guardian--it was about half a mile from my house! We do tend to glamorize murder in fiction, don't we, when the real motives are so often greed, money, and drugs, as was the case here . . . I live in a much larger city than the settings of most cozies, but we were recently rocked when a police officer was shot by a lunatic schizophrenic woman after he pulled her over. That just doesn't happen here; it happens in Detroit and LA. The news networks even threw out the statistic that the last time a police officer was murdered in this area occurred in the 20s or 30s. As a result, the whole state has been traumatized, and when the officer's memorial service was held last week, there was a parade procession that involved over 100 police and fire vehicles from across the state (and even from a bordering state). It was amazing--I was stuck in traffic watching it for about 25 minutes. I watched every kind of police, rescue and even SWAT vehicle drive by, with different city names emblazoned on their doors. Usually in places like here, where murder rates are low and the death rate of police officers is even lower, that kind of crime can completely shake the community. Maybe that phenomenon is what we find so fascinating in traditional cozies, beginning with Agatha Christie's works. How well do you really know your neighbors? Could you have been a potential victim all along and never knew it? It throws our security into question, and that is a very compelling (and scary) thing to contemplate. Vicki! Thank you so much for joining us...hope our paths cross again soon! Thanks, Hank. Lovely talking to such engaged readers and writers. "I'm walkin' to New Orleans..."
Getting Organized with Mary Jane Maffini. 3, 2, 1, You're On!